A few months ago, Nate's hairstyle was starting to resemble a mullet. I've spent substantial time living in Texas and Upstate New York so I advocated for keeping the party in the back. But Dave insisted, so I trimmed a little off the back and sides to neaten it up. But Nate's hair grows fast and this past weekend we decided it was time for a real first haircut. The poor guy was miserable. He hates to have his space invaded by strangers. But since he didn't have any crackers to throw at the hairstylist, he cried instead. The fancy jeep seat and the Elmo dvd could not persuade him to relax and enjoy the experience. At first I was not going to highlight the super flattering picture of me on the bottom left, but you can really see how upset he was in that photo. I felt so bad. In the end he got a great new 'do (and a BOON!) so I think it was worth it. 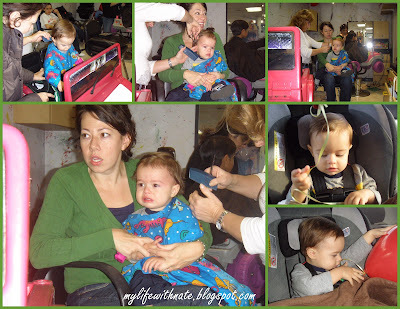 What was your baby's first haircut like? And don't forget to enter my Earth Mama Angel Baby giveaway HERE. Are you a breastfeeding mama? You may be interested in my breastfeeding articles HERE. Enjoy reading my blog? Help me reach a wider audience about the benefits of baby sign language and non-toxic toys by voting for me below at Top Mommy Blogs or Top Baby Blogs. You can vote daily! Name my friend's baby and win a placenta!